The Electric Vehicle Competitions team from Brigham Young University have set a new record for the world's fastest electric-drag-race car to be powered solely by capacitors. This paper describes the use of ultra capacitors to power that experimental drag race car. 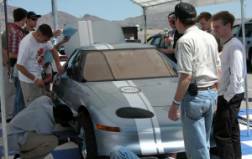 A production EV1, donated in 2002 to BYU by General Motors Corp., was fitted with a bank of 160 ultra capacitors and timed on a one-quarter-mile drag strip at an official competition of the National Electric Drag Racing Association (NEDRA). The car performed as predicted, providing optimism for the use of ultra capacitors in the transportation industry. The design of the capacitor pack and the performance of the car are discussed along with suggestions for using ultra capacitors in other automotive applications. Competition stimulates innovation. This has been particularly true in transportation. Common automotive technologies of today such as rear-view mirrors, brake lights, windshield wipers, disk brakes and turbo-chargers were all conceived through racing. Brigham Young University's (BYU) Electric Vehicle (EV) Competition team believe that competition and innovation stimulate learning, and that students thrive when challenged to come up with winning concepts that will be tested on the race track. During fall 2002, recognizing this philosophy and other BYU accomplishments, the General Motors Corporation (GM) donated to the BYU School of Technology an EV1. The EV1 is a battery-powered, two-passenger sedan. It was manufactured from 1995 to 1999 and was available for lease to the public in the southwest parts of the United States. In 2002 all leased vehicles were recalled. Some of the recalled vehicles were donated to universities and other institutions for research and educational purposes. The BYU team, pursuant to the conditions of the donation, were unable to drive the car on public streets, but desired to actively use it in an educational way. Because of the EV1's excellent aerodynamics and lightweight aluminum construction, racing was chosen as the logical educational activity. It was decided that the car would be drag raced. Drag races are one-quarter mile long. They test a vehicle's acceleration from a standing start and top speed at the end of the quarter mile. Weight must be minimized, and the drive system must withstand repeated runs at maximum power output. Electric drag race cars are typically gasoline production cars that have been converted to electric power. The EV1 was unusual in that it was originally manufactured as a battery-powered vehicle. The National Electric Drag Racing Association (NEDRA) classifies vehicles by vehicle type and voltage. BYU's EV1 was classified as "modified-production over 241 volts" and is the only car known to NEDRA in that classification. NEDRA often holds events in the western states which would provide a venue for competing with similar-purpose, electric-powered vehicles. The EV1 was supplied to BYU without batteries, battery charger, or motor controller. The first decision for the team, then, was how to power the car. Batteries were, of course, considered first. 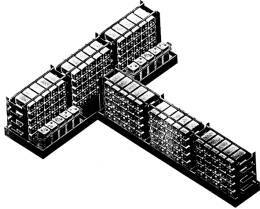 Suppliers of various types and sizes of batteries were contacted and their products considered. The difficulty with batteries was that sufficient energy to provide 400 volts of potential at a rate of 400 to 600 amps required a pack of batteries weighing between 400 and 600 pounds. The total energy stored always exceeded the requirements of the race, which called for about 100 KW of power for a duration of no more than twenty seconds. The need for only a short burst of power suggested capacitors in place of batteries. Capacitors are devices that store charge between two electrically-conducting surfaces separated by a thin space, usually filled with an insulating dielectric. The characteristics of a capacitor are that it charges very rapidly when a voltage is applied to the plates, stores charge indefinitely if there are no electrical leaks, and discharges rapidly when the plates are connected to a load. Impressed with the possibilities of capacitor power for their drag-race car, BYU students began searching for sources of large capacitors. The search led to ultra capacitors. A relatively recent development in capacitor technology is the ultra capacitor, developed for large-scale power applications in industry and transportation. Ultra capacitors provide energy densities high enough to be used for vehicular applications. They can store enough energy to accelerate an automobile. The energy storage ability, or capacitance of one of these devices ranges up to several thousand farads, rather than a few hundred microfarads as is common in electronics components. Ultra capacitors consist of activated carbon sheets separated by thin non-conductive membranes, immersed in an organic electrolyte. Charging the capacitor moves cations and anions to opposite carbon layers. Because this movement is not a chemical process it is easily reversed with no detriment to the capacitor. Thus, the capacitors can be repeatedly charged and discharged with no deteriorization. This is an important factor in vehicular power applications where many charging cycles occur. Batteries deteriorate rapidly under repeated discharging and charging, and require periodic replacement. With ultra capacitors no such replacement is necessary. The charging and discharging characteristics of the ultra capacitor are approximately those of a conventional capacitor and are given by the first-order differential equation. The voltage in the capacitor increases linearly with time when charged with a constant current. Likewise, the voltage decreases continuously during discharge. This is in contrast a battery, whose discharge voltage is nearly constant until it is almost completely spent. Ultra capacitors can be charged and discharged quickly. It can take only a few seconds to charge an ultra capacitor, whereas it can take hours to charge a chemical battery. Depending on the load, ultra capacitor discharge is also possible in seconds, whereas, for similar loading, battery discharge time is on the order of several minutes. The weight of a bank of ultra capacitors storing sufficient energy to accomplish a twenty-second run in the EV1 was also considerably less than the lightest set of batteries investigated by the team. These favorable performance characteristics persuaded the BYU team to try ultra capacitors in place of batteries for the EV1 drag-race car. With the decision made to use ultra capacitors in the race car, design and construction of the storage pack was begun. A preliminary estimate of the energy needs for the race, combined with the maximum voltage rating of the motor and controller, indicated that the car would need a storage pack consisting of 160 capacitors where each capacitor was rated at 2700 farads and 2.5 volts. The capacitors were connected in series using copper bars for conductors. They were mounted in six sets of twenty-five plus two sets of five. This allowed the use of the original, "T"-shaped battery storage box which came with the EV1. The capacitor mounting arrangement is illustrated in Figure 1. Students designed the capacitor bank using a solid modeling program and machined the copper bars and ABS plastic structural frames on a computer-controlled milling machine. The completed pack, including the connectors and mounting hardware, weighed 370 lbs compared with 1310 lbs for the original GM lead-acid battery system. The power inverter-controller had been disabled in the EV1 when it was given to the university, necessitating the installation of a new motor controller to convert the high-voltage DC into AC power for the three-phase, four-pole induction motor supplied with the car. The controller is adapted from a commercially available unit made by EMS. It is designed to handle currents of up to 400 amps at 400 volts. It employs a micro-computer to control six integrated-gate-bi-polar-transistors (IGBT). A data acquisition system is included to monitor the current and the voltage of the motor and ultra-capacitor bank during the race. Accessories not specifically required for racing were removed from the EV1 to eliminate unnecessary weight. This included the original wiring, headlights, fans, air-conditioning, power steering, instrumentation, passenger seat, and some upholstery. The rearview mirrors and the underbody aerodynamic sheeting were also removed. The car weighed 1801 lbs with the capacitor bank installed compared to the original weight of 3086 lbs as delivered from GM. The original electric motor and single-speed drive were used without modification. The suspension was also unmodified except for the installation of stiffer springs on the rear of the car and the addition of custom-made racing wheels fitted with drag-racing tires on the front. Circuitry for the cooling system, electric brakes and motor-control computer were designed, fabricated and installed by the students. A potentiometer was used to sense throttle demand as an input for the controller. Emergency rear brakes were wired. A motor-controller programming keypad was installed in the center console of the passenger compartment for the driver to enter operational parameters and to monitor variables such as capacitor bank voltage. The completed car was tested on a chassis dynamometer to set critical control parameters, determine the output of the motor and check the total efficiency of the system. The capacitor's continually changing voltage presents interesting problems during both charging and discharging. During discharge the motor controller must deal with a continuously decreasing supply voltage and when charging, the charger must operate over a wide voltage range and approximately a constant current. The most convenient 400 volt supply available to the BYU team for charging the ultra capacitors was a set of lead-acid batteries used in their Formula Lightning series road-racing electric car. Charging the ultra capacitors from a 400- volt bank of batteries proved to be a problem for several reasons. A direct connection between the batteries and the discharged capacitors is nearly equivalent to short-circuiting the batteries, causing excessive current to flow during the first part of the charging cycle. It order to limit the current flow into the capacitors on initial connection of the batteries, the team connected a set of four, 500-watt halogen work lights in series with the capacitors. As the voltage difference between the battery bank and the capacitor bank decreased, the lights were progressively switched to a parallel configuration to reduce the resistance. For the last few volts of the charging cycle all the lights were removed and the capacitors were directly connected to the 400 volt battery pack. Charge cycles were relatively slow and complicated, requiring great care to avoid damaging components with too high a voltage or too high a current. As a further inconvenience, the charging source relied on a heavy 400 volt bank of lead-acid storage batteries which had to be kept near the car at all times. The team plans to build a fully automatic, constant-current charger to resolve these problems. Prior to completing the car, a mathematical simulation of the race was developed. This took into account the capacitance of the ultra capacitor bank, power output of the car's three-phase motor, electromechanical efficiency of the motor controller, motor and gear reducer plus the total tractive effort available from the front wheel drive configuration. The simulation provided a prediction of the acceleration, capacitor bank voltage, and motor current during the race. The simulation showed that the car's acceleration would be limited at the beginning of the race by the amount of traction that the tires could produce. As the race progressed the acceleration would be limited by the power available from the motor. Near the end of the race the output would be sharply limited because the maximum motor speed would be reached. The simulation predicted that the car would finish the race in approximately sixteen seconds with a final speed of eighty miles per hour. The first testing of the car on a timed race track was at the Rocky Mountain Raceway in Salt Lake City, Utah. This is a one-quarter-mile strip with electronic timing that reports elapsed times and speeds at sixty feet, one-eighth mile, and one-quarter mile distances from the start. After each run the capacitors were recharged from the battery pack. The battery pack allowed five or six charges before its source voltage dropped below 400 volts and it would no longer fully charge the capacitors. The car's best elapsed time at the Rocky Mountain raceway was 15.774 seconds. The car accelerated to 69.57 miles per hour in the first 1/8th of a mile and finished the ¼ mile race at 77.47 miles per hour. Almost all the acceleration occurred in the first half of the race. These results were close to the predicted values, and, as predicted in the mathematical simulation, tire traction limited acceleration at the start of each race. With the Rocky Mountain Raceway experience as practice, the team entered the car in an official NEDRA competition held at the Las Vegas Speedway in Nevada. This event provided the venue for an official record for the first and the only known capacitor-powered race car. The NEDRA official elapsed time for the quarter-mile run was 15.94 seconds. Front-wheel traction was again an issue, aggravated by the fact that the EV1 came with an open differential, meaning that if one wheel looses traction and starts slipping, no power is supplied to the other wheel. The car experienced no other mechanical or electrical problems, a tribute to the care and technical competence exhibited by the students in the design and construction of the car's modifications. The relatively small energy storage of ultra capacitors (compared to gasoline or conventional batteries) requires careful management. At the end of each race the motor controller would show and under-voltage condition, indicating that all the useable energy had been consumed. It is critical that the motor run in its most efficient speed range throughout the race. This will require a change of gear ratio at the point where the motor speed begins to exceed its peak torque range. The team plans to install either a two-speed or continuously variable transmission to accomplish this. Tire slip at the starting line wastes useful energy and time. The team plans to reduce this in the future by programming the motor controller to limit the torque applied to the tires to the maximum level that the tires can sustain without slipping. The car's open differential will also be changed to a locked or limited-slip type to equalize the torque applied to each drive wheel. Practical applications of ultra capacitors in the transportation industry occur wherever rapid capture, storage, and release of energy are called for. One possibility involves hybrid vehicles. Hybrid electric/internal-combustion (IC) power for cars promises improved fuel economy, provided an economical means can be found to supply intermittent power demands for acceleration and hill climbing. A common hybrid/electric configuration relies on a smaller (IC) engine with an electric motor - generator coupled directly to its crankshaft. When the car is stopped in traffic or at stop lights the IC engine shuts off, and is immediately started again when the clutch is depressed. The IC engine powers the car during low power demand and charges the battery pack that powers the car's electric motor-generator. The electric motor is only used during peak power demand such as when accelerating and climbing hills. The rest of the time it is idle or, when the car needs slowing down, serving as a generator to put electricity back into storage. Today's hybrid cars use chemical batteries as the storage medium, which are heavy and subject to deterioration and damage with use. Toyota, Honda, and other manufacturers have introduced hybrid cars as part of their product lines, demonstrating that serviceable cars can be powered with a combination of electric and gasoline power. It remains to be seen whether their chemical batteries meet the service life requirements car owners have come to expect. All chemical batteries, including the ones used in these production cars, must be charged carefully to avoid deterioration. The life of chemical batteries is shortened if they are repeatedly "deep cycled" between a fully charged and a partially-charged state. This suggests that, for economic life, the batteries in a hybrid car must not be discharged too deeply but kept at a nearly full state of charge. This being the case, ultra capacitors could serve in place of batteries in a hybrid vehicle because they store only sufficient energy for occasional high-power needs and they can be completely discharged and charged hundreds of thousands of times with no loss in storage capacity. This means lower initial and life-cycle costs because the electrical storage system could be sized to closely match the intermittent requirements of the vehicle and would also last as long as the rest of the car. In addition, ultra capacitors generally weigh less than an equivalent battery pack, making the capacitor-hybrid vehicle more energy efficient. Other applications of ultra capacitors include hybrid delivery trucks and busses that experience much stop-and-go driving with accompanying acceleration and deceleration. Electric trains running on a catenary power grid could benefit from ultra capacitor storage where the capacitor bank could be kept in a local building instead of on board each train. Such a system could recover most of the regenerative energy from the combined breaking of all the trains in the system. Conventional cars and trucks could benefit by using ultra capacitors to supplement a chemical battery. The ultra capacitors might only be used for the short demands of starting the IC engine, thereby permitting a much smaller storage battery to be used. The BYU race team found ultra capacitors to be a viable energy storage medium for the high-power demands of drag racing. Ultra capacitors were successfully used to power a modified EV1 in repeated quarter-mile acceleration tests. These accomplishments suggest that ultra capacitors are a reliable storage technology for repeatedly supplying high power for short time intervals, and should be considered for other automotive applications such as hybrid cars, trucks and buses.